Former skipper Aditya Tare scored his eighth first-class hundred on an inconsequential final day of their Ranji Trophy group A encounter against Railways here on Sunday. Having ensured three points by virtue of 104-run first innings lead by the end of the third day, Mumbai decided against sporting declaration reaching 321 for 5 when captains decided to call time. Tare (100 no, 187 balls) and all-rounder Shivam Dube (69 no, 99 balls) added 163 runs for the unbroken sixth wicket stand. Tare's innings had 11 fours and two sixes and Shivam smashed eight fours and a couple of sixes. The duo came together when Mumbai were 158 for 5 in their second innings but Tare-Dube didn't feel much pressure as the overall lead had already swelled to 262 runs by then. Left-arm spinner Harsh Tyagi (3/86 in 36 overs) was the most successful bowler for Railways. Siddhesh Lad (76, 168 balls) also continued in rich vein of form having scored 99 in the first innings. Lad will however rue the fact that he missed three-figure mark twice during the match and was dismissed by left-arm orthodox on both occasions. Mumbai 411 and 321/5 (Siddhesh Lad 76, Aditya Tare 100 no, Shivam Dube 69 no; Harsh Tyagi 3/86). Mumbai 3 points Railways 1. Baroda 290 and 179 (Pinal Shah 71, Rush Kalaria 6/35) vs Gujarat 302 and 168/1 (Priyank Panchal 112). Gujarat win by 9 wickets. Points: Gujarat 6; Baroda 0. 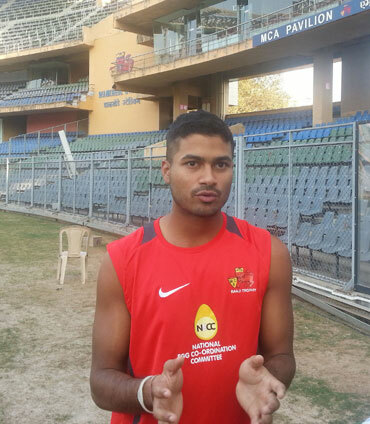 Saurashtra 475 and 178/5 (Sheldon Jackson 52, Sahil Gupta 4/69) vs Chhattisgarh 355. Points Saurashtra 3; Chhattisgarh 1. Tamil Nadu captain Baba Indrajith hit an unbeaten century as the team finished at 236 for 4 on the final day of the rain-hit Ranji Trophy Elite Group 'B' match against Madhya Pradesh in Dindigul (Tamil Nadu) on Sunday. The hosts innings finished at 236 for 4 in 77.4 overs in reply to Madhya Pradeshs 393 as rain intervened again. The two teams finished with one point each as the first innings was incomplete. After the third day's play was washed out on Saturday owing to incessant rains, Tamil Nadu resumed its first innings at zero for no loss and saw openers Abhinav Mukund and Murali Vijay negotiate the early spell by MP bowlers to take the score to 43 for no loss. Vijay, who appeared to be confident in his knock of 19, edged a delivery from Avesh Khan to wicketkeeper Ankit Dane. Mukund (28) fell nine runs later for 28, which contained four boundaries, caught superbly by Rajat Patidar of the bowling of spinner Ankit Sharma. Indrajith and his twin brother Baba Aparajith (who came in at No.3) added 80 runs in nearly 30 overs with some enterprising play. Indrajith was in fine touch and hit some sparkling shots and his partnership with Aparajith gave the innings some impetus. After Aparajiths exit, the captain was involved in a half-century partnership with Vijay Shankar (17), who didn't look at his fluent best. Later, Indrajith and B Anirudh Sitaram (28 not out) put on 51 runs for the fifth wicket before rain brought about a premature end to proceedings. Earlier, Madhya Pradesh made 393, riding on Patidar's brilliant 196. For Tamil Nadu, Test spinner R Ashwin and paceman M Mohammed, who took a hat-trick, scalped four wickets, were the star performers. Mohammed's hat-trick included the wickets of Yash Dubey, Patidar and Mihir Hirwani. Brief scores: Madhya Pradesh 393 in 157.4 overs (Rajat Patidar 196, Aryaman Vikram Birla 51, Naman Ojha 45, R Ashwin 4 for 85, M Mohammed 4 for 98) vs TN 236 for 4 in 77.4 overs (B Indrajith 103 not out, B Aparajith 31, Anirudh Sitaram 28 not out). Points: TN: 1; MP: 1. At Thiruvananthapuram: Kerala 495 for 6 declared in 164 overs (Sachin Baby 147, V A Jagadeesh 113 not out, Jalaj Saxena 58, Sanju Samson 53, Saketh 3 for 110) vs Hyderabad 228 for 5 in 112 overs (B Sandeep 56 not out, Himalay Agarwal 48; Akshay Chandran 2 for 44). Points: Kerala: 1, Hyderabad: 1. At Amtar: Bengal 380 all out in 116.1 overs (Manoj Tiwary 55, Anustup Majumdar 52, Abhishek Kumar Raman 48, PP Jaswal 5 for 81, RR Dhawan 2 for 56) and 203 for 3 in 67 overs (Abhishek Raman 87, A R Eswaran 76) vs Himachal Pradesh 324 all out in 115 overs (A K Bains 86, S L Verma 46, Praditpa Pramanik 4 for 60). Points: Bengal: 3, HP: 1. At Vizag: Punjab 414 all out in 156.2 overs (Sanvir Singh 110, Mayank Markande 68 not out, Mandeep Singh 68, Shubman Gill 56, B Ayyappa 3 for 78, Karn Sharma 3 for 115) vs Andhra Pradesh 423 all out in 156.5 overs (Ricky Bhui 181, K S Bharat 76, B Sumanth 54, Shoaib Mohammed Khan 52, Mayank Markande 5 for 129). Rajasthan defeated a gritty Jammu and Kashmir by 75 runs in their Elite Group C Ranji Trophy game in Jaipur on Sunday. Rajasthan bowlers rose to the occasion even as a Jammu and Kashmir skipper Parvez Rasool (110 not out) played a defiant knock in the second outing, albeit which went in vain, at the Sawai Mansingh Stadium. Chasing a daunting target of 395, Jammu and Kashmir, who began at overnight score of 34/0, were eventually bundled out for 319 in their second innings. For the hosts leg spinner Rahul Chahar (4-89) and Nathu Singh (4-83) took four wickets each in the second innings, as they earned six crucial points and have stated their campaign on a winning note. Chahar ended the game with nine wickets as he had taken a five-wicket haul in the first innings. Brief Scores: At Jaipur Rajasthan 379 and 219/4 declared (A V Gautam 68) vs Jammu and Kashmir 204 and 319 (Parvez Rasool 110 not out, Nathu Singh 4-83). Rajasthan won by 75 runs. At Bhubaneshwar: Odisha 324 and 267/7 (Biplab Samantaray 103 not out) versus Haryana 442 all out (Himanshu Rana 164, Chetan Bishnoi 75). Match Drawn. Haryana took first innings lead. At Agartala: Tripura 360 and 232/2 Declared (U U Bose 109) vs Services 238 and 164/6 (Ravi Chauhan 47). Match Drawn. Tripura took first innings lead. At Ranchi: Jharkhand 344 and 230/4 Declared (Ishan Kishan 120) versus Assam 298 and 140/2 (Sibsankar Roy 52 not out). Match Drawn. Jharkhand took first innings lead. At Kanpur: Goa 152 and 165 (Darshan Misal 51 not out, Ankit Rajpoot 5-41) against Uttar Pradesh 564/4 Declared (Aksh Deep Nath 194, Mohammed Saif 126, Priyam Garg 117 not out). Uttar Pradesh won by an innings and 247 runs.